Venture deep into outer-space, and you’ll come across asteroids… planets… space shuttles… and of course, Net Entertainment’s Alien Robots! This futuristic, space-themed Video Slot is a must-see for any serious slot player, space-fan, or sci-fi geek – making virtually all online casino players suitable to play! Alien Robots uses 5 reels, and 30 pay lines as its main layout, although you can choose to play the 243-ways-to-win variation, for an extra cost per spin. The game is designed in-line with its theme, and Net Entertainment have opted to go for a cartoon-like approach with Alien Robots; it looks pretty cool, and while it’s a simple design, it manages to set the tone effectively. The low-paying symbols in Alien Robots are playing-card symbols, 10 through Ace, and the high-paying symbols include a variety of different-coloured robots, starting with Blue, and rising in value through Green, Yellow, Orange, and Red. The Wild Symbol is a creepy-looking alien with a green brain, and the scatter symbol is designed as a UFO. The overall look and feel of the game is quite retro; it gives off almost an 80’s video game vibe, and whether or not this was Net Entertainment’s intention… they’ve done a good job at creating a game that offers both exciting gameplay, alongside decent-sized payouts! 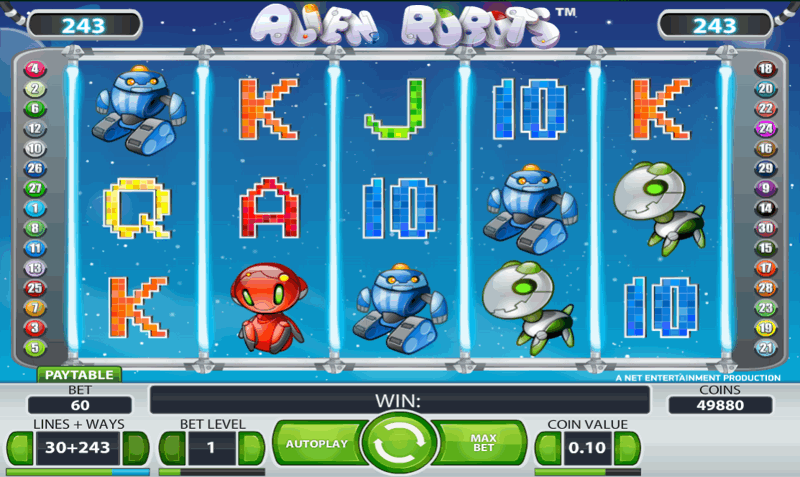 Alien Robots is available on both desktop devices, and mobile phones and tablets, ensuring you can play this wacky space-themed Video Slot from whenever you want. Note: Mobile players may need to tilt their device into landscape mode in order to begin playing. 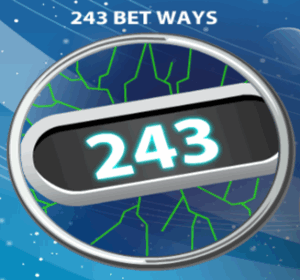 If you’ve played a 243-ways-to-win slot before, you’ll know just how much fun it can be. It essentially removes the pay lines, and means that you only need three or more symbols on consecutive reels (starting on reel one, and moving left-to-right) in order to secure a win. Land two symbols on reel one, and one on reels two and three, and you get paid 2X 3-of-a-kind. Land three of the symbols on reel one with one on reels two and three and you get paid 3X 3-of-a-kind, and so on. If you want to play the 243-ways-to-win way, your stake will double, but it’s generally well-worth doing, as it not only makes the gameplay a lot more exciting, but it also makes wins easier to come by. 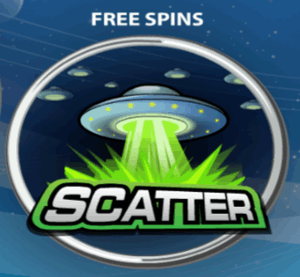 If you land three of the UFO scatter symbols in view during the base-game, you’ll be awarded with 10 free-spins. Land four of the scatter symbols to receive 20 free-spins, and if you can land all five, you’ll be awarded a massive 50 spins! Once the free-spins have begun, the wild symbol begins to play a much more important part in the game. When it lands, it will turn the reel it lands on completely wild, locking in place for a free re-spin. The wild can land on reels 2, 3, and 4, although landing one on reel 3 is quite rare. It’s quite common to land two wilds on reels 2 and 4, and this awards 2 free re-spins.